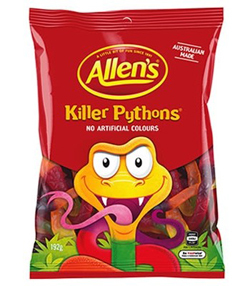 Each bag contains four jelly shaped pythons approx 31cm in length. Each python has various colours and flavours down its length. These big, long chewy pythons will take a while to consume but which end will you start from? Glucose Syrup (Wheat or Corn), Cane Sugar, Thickener (Dextrin Roasted Starch, Acid treated Starch or Starch acetate) (Wheat), Gelatine, Food Acid (Citric), Flavours, Colours (Black Carrot, Carminic Acid, Paprika Oleoresin, Copper Chlorophyllin, Turmeric, Vegetable Carbon). Myself & my fiancee have been to Australia 5 times between us & ate these every time we were there.We travelled by camper from Perth up to Broome - Camooweal-Cairns-Noosa-Sydney & bought these at every road house we went to.They are very tasty.